Handmade porcelain dimpled cup set with a matt white glaze on the outside and soft coloured inside. Available in pale blue, pale pink, grey and turquoise. 8.5cm x 9cm, holds 250 ml Handmade by Linda Bloomfield in London. Sold on chalkandmoss.com. Handmade dimpled cup, turquoise. With a matt white glaze on the outside and soft coloured inside. Available in pale blue, pale pink, grey and turquoise. 8.5cm x 9cm, holds 250ml Handmade by Linda Bloomfield in London. Handmade dimpled cup, pink. With a matt white glaze on the outside and soft coloured inside. Available in pale blue, pale pink, grey and turquoise. 8.5cm x 9cm, holds 250ml Handmade by Linda Bloomfield in London. Handmade dimpled cup, grey. With a matt white glaze on the outside and soft coloured inside. Available in pale blue, pale pink, grey and turquoise. 8.5cm x 9cm, holds 250ml Handmade by Linda Bloomfield in London. Handmade dimpled cup with a matt white glaze on the outside and soft coloured inside. Available in pale blue, pale pink, grey and turquoise. This dimpled handmade mug in porcelain moulds beautifully to your hand. With a matt white glaze on the outside, each mug has a coloured inside. The mug is available in four soft pastel shades: pale blue, pale pink, grey and turquoise. The delicate colour of these cups has the uplifting shades seen at dawn, with its pink, blue, turquoise or delicate grey tones. The shape of the coloured mugs draws on the Japanese yunomi, used for drinking green tea. The dimples replace handles for a cosy, relaxed moment. If the drink is too hot, just hold the top until cool enough. These are handmade pottery mugs from the UK. 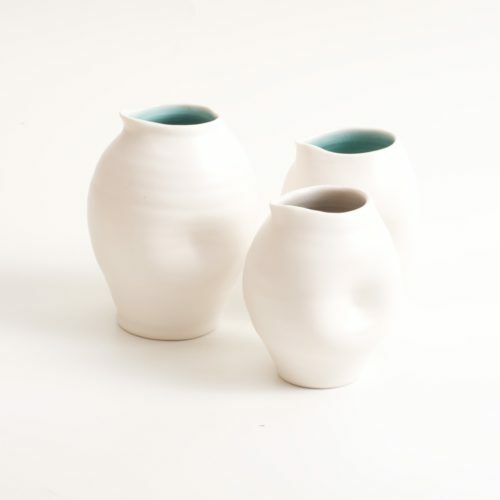 Each porcelain cup is hand thrown by Linda Bloomfield in her west London studio. Linda throws her products on the wheel in English porcelain, then adds dimples to the clay while it’s still soft. She uses jewel coloured glazes and a tactile satin glaze. As a former scientist, she makes her own glazes, which are all dishwasher safe. If you like this dimpled handmade mug, why not have a look at the rest of Linda’s dimpled range? The designs in the collection are intended to look great together. See all the pieces here.